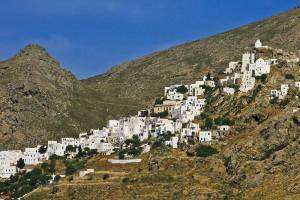 The slopes of Serifos are full of trails which were used daily by the residents in the old days. Some lead to exquisite coves and others to majestic places –hideaways indeed. Although there are detailed maps describing the paths of the island, the winter rain and the weeds tend to erase their tracks. Therefore, before you start walking, ask the locals which ones are accessible. HELIPAD-CHORA: It was called “road of Plakes” and it was the road that the miners used to take, in order to reach the western areas of the island and get to work. It was built in 1858, it is still well-preserved (it helped a lot the initial good construction) and it constitutes one of the most beautiful paths of the island. The starting point is located just before the helipad (Gyftika area) with a signpost to Agios Georgios (the path to the village of Panagia begins on the right as well). As you walk on, you have on your right hand Oros. Continue walking on the infertile mountainous landscape with the scattered “cells” and 10 minutes later you will find the beautiful chapel of Ai-Giorgis where you can stop and rest in its courtyard. Following, you shall go downhill the nice, wide, cobblestone path which was rebuilt in 1960. 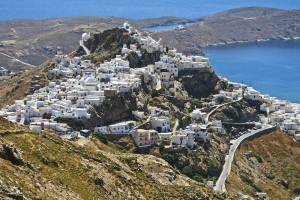 The view is magnificent as it is the only part of the island that is higher in altitude than Chora. In 20 minutes you shall arrive at Ano Chora. CHORA-PORT: The entrance to the famous path connecting Kato Chora with Livadi is found on the main road next to Kato Vrysi. As you pass through Varda district, you shall arrive at Evagelistria church. Continue walking straight ahead following the signpost. The mansion with the big palm tree that you will find on your way, houses the Folklore Museum and the chapel you will see across is Agios Antonios. Further down and on your left, you will see a Heros’ Memorial. The beautiful building on your right with the tiles is the Elementary School. At the chapel of Stavros, the path is intersected with the main road and it continues right across. As you walk down the well-preserved alley you will pass by Panagia Xekourastra, which calls you for a break. 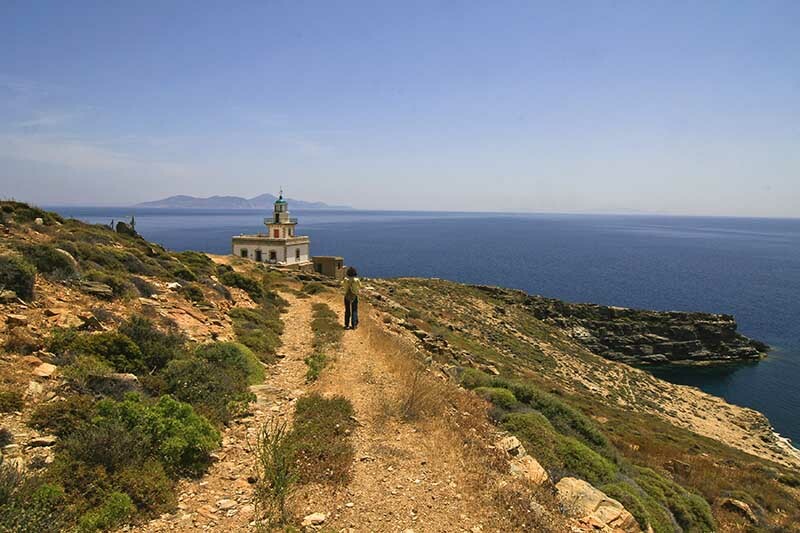 When you reach the last chapel of Agios Isidoros (built in1670), by then you will be intersected with the main road two more times, the path ends. While you continue on the same route, on the main road, for 1.3 km, you will arrive at Livadi. KENTARHOS-CHORA: The paved street that once connected Kallitsos with Chora and served the rural needs of the residents in the valley of the old ‘mitata’ has suffered many damages over the years. Your starting point is the village Kallitsos at northeast. From there you shall continue uphill to Vounaki, enjoying a panoramic view to the pelagos and Serifopoula, you shall arrive at a col (in 20 minutes), from where you can enjoy a wonderful view. You shall continue on a big paved street, passing by the “Palia mitata” and areas with big granite rocks. In about half of the road you will find the country church of Pano Stavros, from where you shall continue further down entering an area with vineyards and dry stone-walls. You shall pass through a little bridge and continue uphill towards the country church of Agios Stefanos. Afterwards you shall see the water fountain located at Palio Pigadi, under the arch bridge. After one last ascent you shall arrive at Chora. To Kalitsos beach. The path that leads to Kentarhos beach, is wide and paved. Your starting point is at the centre of the village at the Mouria tap. You shall go downhill at a ravine, that is overgrown with vegetables, orange trees, lemon trees, a variety of pears called “Stravoria” and old plantations. Be cautious, as sometimes the path is not totally clear. The total duration of the hike is about 20 minutes. WHITE TOWER-KOUTALAS: This trail offers a view to the beaches around Koutalas Bay. The main characteristic of the region is the rusty colour and the traces from the period when the mines were blooming. The trail starts just before the White Tower (see Discoveries). Go downhill on the left side towards Koutalas and when you reach the first crotch turn left (it takes about 5 min to get there). After you pass through the deserted small stone-houses and a white house next to a water source, you shall reach a fence made of stone. Pass trough its door and continue walking uphill. You shall see opposite to you the “Grias Castle”. From that point and onwards you shall enter the old mining roads. The landscape is full of old mines and mining facilities. Continue walking until you find the rails, which you shall follow until the end of the path. After you pass next to the ramp (that is made of stone) at the end of the rails search for the trail that lead to Koutalas (Be careful as the descent is a bit difficult). 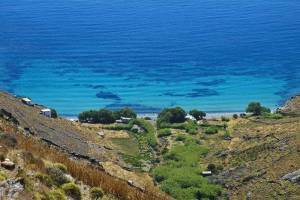 There are three more interesting paths, from the village of Panagia towards Sykamia, from the helipad towards Varsamo and Panagia Village and from the small settlement of Pyrgos towards Sykamia.